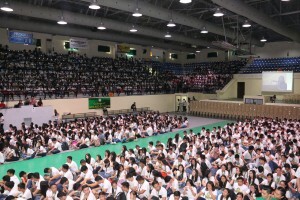 Around 3,000 new Josenian students were officially welcomed to the University through the traditional Pakighimamat activity at the Recoletos Coliseum on July 14, 2018. Pakighimamat is a part of the General Orientation Activities organized by the Student Development and Placement Center (SDPC) that aims to introduce the new students to the Josenian Family as well as to their new environment and to help them develop a sense of belonging. It is the culmination of the three orientation activities namely the university guided campus tour, college convocation, and group guidance. Campus Tour is a one-hour tour around the university that enables the students to be familiar with the different locations of offices. They are arranged by their respective Guidance 1 class schedules and are assisted by the Peer Facilitators and Volunteers. The second phase is the College Convocation. The students get to know their respective college dean, faculty and policies. The new students were introduced to the different facilities and services especially that of the Student Affairs Office (SAO), Supreme Student Council (SSC), and the Student Development Placement Center (SDPC). This year’s Pakighimamat is anchored with the theme, “With a Heart of Excellence: Be the First, Be the One.” The program started with an Opening Salvo led by the SDPC Peer Facilitators followed by the Processional of the Religious and Lay Administrators. The rationale of the program was given by the SDPC Director, Ms. Nelbha Y. Iglesia, RGC. Vice President for Academics Rev. Fr. Leo G. Alaras also welcomed the Josenians through his message and greetings. 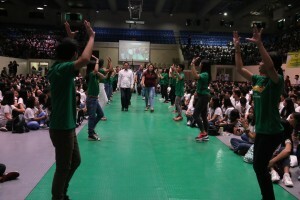 One of the highlights of the program was the presentation of the cheers and yells of the different colleges after the different colleges were introduced by its respective Deans. To show solidarity with the new members of the Josenian student body, everyone in the venue sang the Pakighimamat 2018 Theme Song entitled “Be the First. Be the One” – an adaptation from the song “Shake it Off”. It was performed live by 4th year BS Psychology student Chenaye Gift Marie Mercado. The Grade School and High School Levels also had their Pakighimamat on July 4 while the Senior High School Level celebrated Pakighimamat on July 6.